The bad weather with heavy rainfall has paralised a good part of Italy over the last hours. 280 people were evacuated and 6 police officers are injured in the province of Bologna because of the Reno River went out of the bed. They were rescued thanks to the intervention of a firefighter helicopter and are receiving treatment at the local hospital. In the city of Venice the water reached 113 cm above the sea level. The high precipitation level has forced the closure of a highway section in the Alto Adige region. 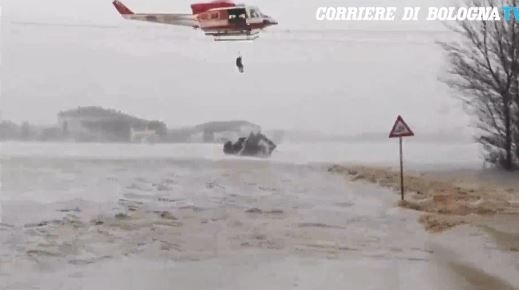 The Po River reached to 3m in the Emilia Romagna region, while in Rome, the Tevere river blow has forced the municipality to shut down all the entrances of the river. The floods have caused many road accidents. The bad weather continues to be in the monitoring of the Civil Protection Directorate.